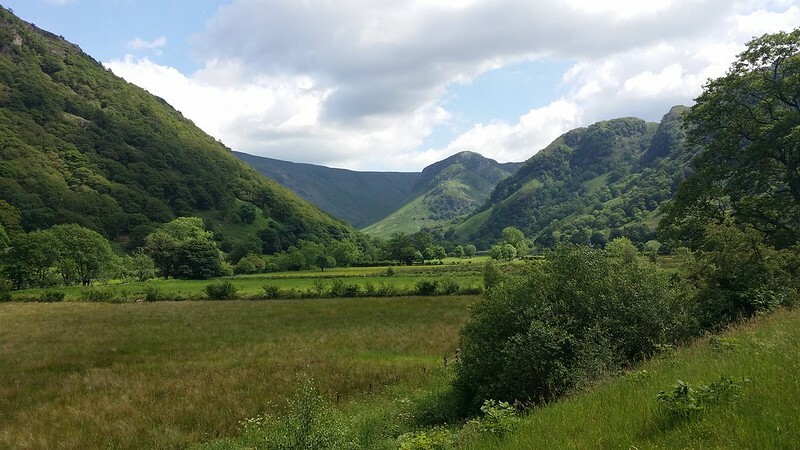 The first thing I saw as I stepped off the bus at Rosthwaite, a stop short of where I ought to, was Eagle Crag, one of my most favourite fells, peering out from behind Rosthwaite Fell. This just reminded me that it’s ages since I’ve been to Borrowdale. 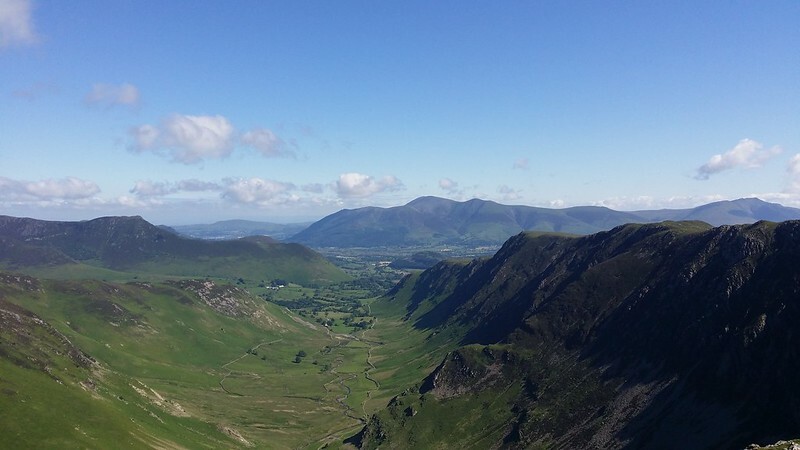 Quite apart from the challenge itself, it would be good to revisit some fells I’ve not walked on for 6 or 7 years. 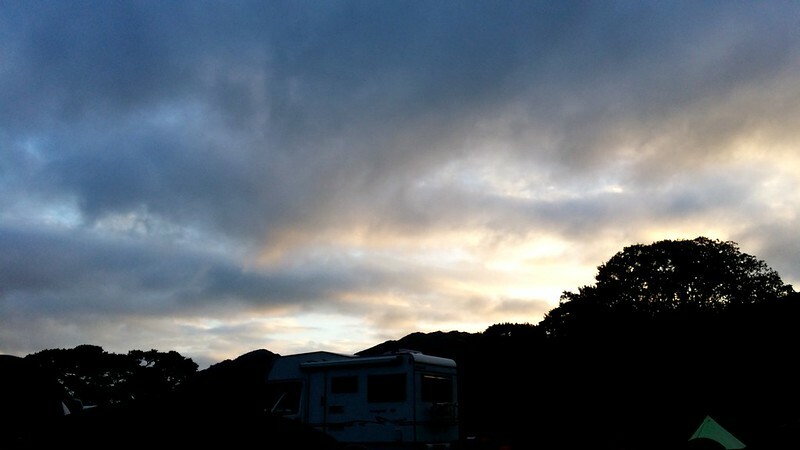 I struggled along the road with too much luggage – a kit bag as well as my rucksack, as I’d taken the opportunity of some extra luxury as we were overnighting in one place the whole time. This short walk reminded me why I don’t use the kit bag very often – it’s unwieldy and heavy – but I’d deliberately done it this way so I wasn’t carrying too large a rucksack on the challenge itself. 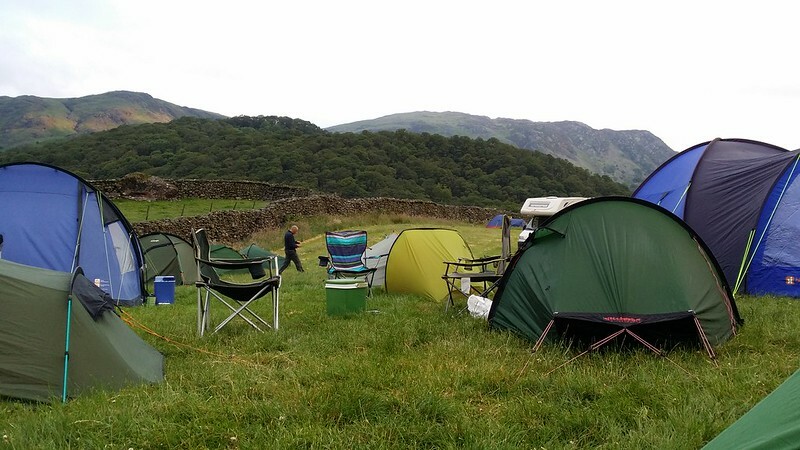 I arrived at the campsite and spotted Tim’s (@ukjeeper) tent over to the right, complete with Social Hiking t-shirt acting as a beacon for the group. Off to the left, however, Cath (@wellycath) had arrived an hour or so before me and pitched up in a nice spot by some trees. I walked over to her and pointed out that she was nowhere near the embryonic Camp Social Hiking. I pitched up and we helped Cath transfer her tent to the group. We waited around a bit while some of the early arrivals returned from the pub, and to give the latecomers a chance to arrive. Then we decamped to the pub. An unexpected surprise in the form of Jilly Sherlock (@JillyS) turned up in the evening, and she regaled us with tales from her epic bike ride and her current life as a semi-vagrant in the Lakes. She’d walked over to meet Phil (@DaylightGambler), and the rest of us from Langdale, and was intending to head back that way for a wild camp, but the craic was such that, I emerged from my tent the following morning and almost fell over an extra tent right in front of mine that wasn’t there when I went to bed. I was up early, before 5am, but no one beat Rose (@RucksackRose), as she barely went to bed. Blame for the cause of the snoring that kept her up was still being apportioned when the camp broke up the following day. 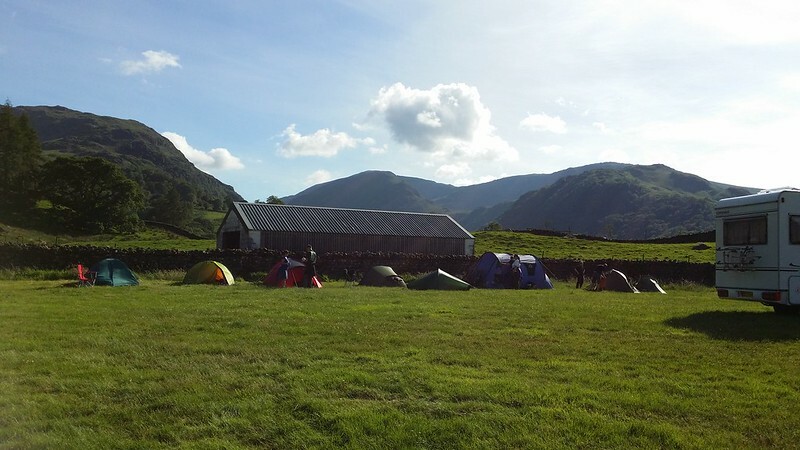 I got some porridge down my neck and was glad I’d taken the precaution of packing everything the night before as I was a bit sluggish myself – the first night of a camp is never a good one for sleep. The 10-in-10 team, plus Phil, Jilly and some of the 5-in-5ers came down to the start line at the Scafell Hotel for the start. All fears of kit inspections evaporated in the melée of participants signing in, and setting off. The team posed for a mandatory selfie at the start. Then we were off. 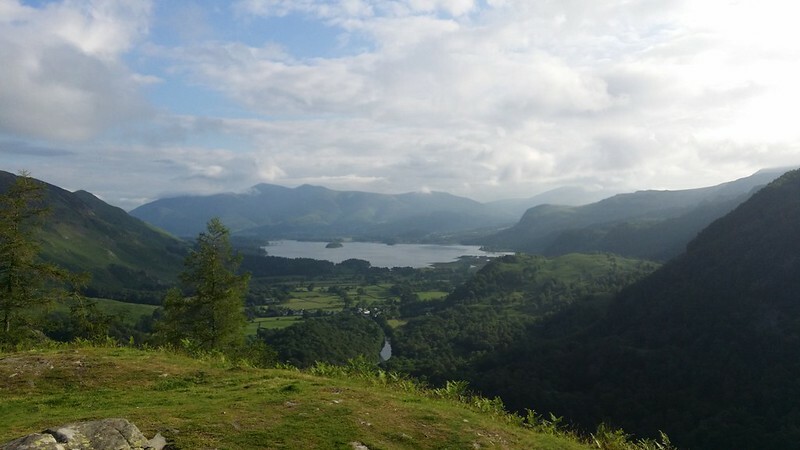 A fair pace was maintained up to Castle Crag, but I quickly found myself at the back when we started going upwards. I’m a slow starter on a hillwalk, the early ascents in the day are slow and it’s not until the afternoon that I find an extra burst of speed and stamina. This, plus the traffic jam of walkers trying to climb up the narrow, winding loose slate path on to Castle Crag at the same time as earlier starters were trying to come down, slowed things down further and spread the team out somewhat. One of the last to arrive on the crowded summit, I didn’t notice that the faster members of the team had already started down while I was still taking pictures and trying to get a phone signal. Cath, Tim, Rich, Mark (@hendry670) and I found ourselves playing catch-up to the rest of the team, and as we slogged our way up Tongue Gill, Rich and Mark pulled out a bit of a gap on the three of us. Rather than try to force the pace, we left them to try to catch the rest of the team. As we neared the top of Tongue Gill and could see the upper parts of High Spy, things weren’t looking great for the rearguard – I was struggling for pace, Tim had a disturbing foot pain and Cath was feeling the effects of the heat and pace. We reached the top of High Spy with some relief. 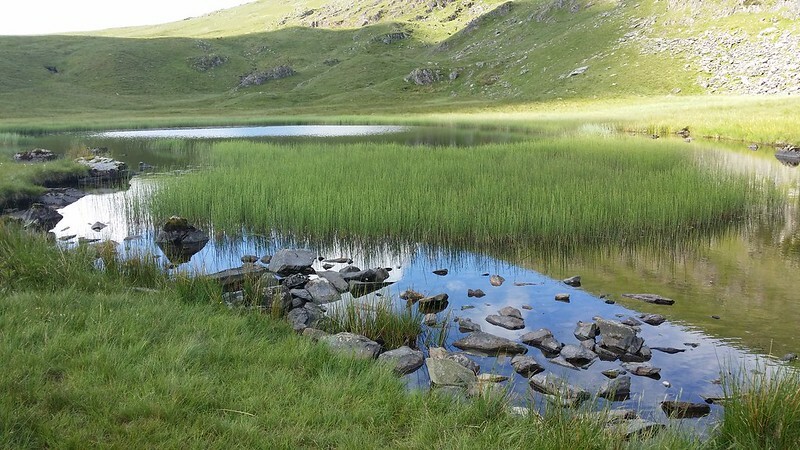 The descent to Dalehead Tarn was fine, and a stroke of luck occurred on the way down – the 5-in-5 team caught us. This provided a bit of a morale boost, and some options for those struggling. The 5ers were already a (wo)man down, as Rose dropped out on the way out due to the effects of no sleep. But Kate (@DiveSciDiva), Pete (@NaturistAtheist), Paul (@paulgbuck) and Andy (@mixedupmessedup) were not in the walk to get a fast time, just to get around and enjoy the walk, and this removed a lot of the concern about how far we’d dropped back from the main group. Nevertheless, as we climbed up to Dale Head, a decision point was looming for me. Although taking a while for my legs to get going, I was feeling fine and even felt I could go faster, maybe even catch the main group. Cath was starting to consider whether staying with the 5ers might be the best option for her, and Tim was looking like he’d be pulling out at Honister. This being the case, the next stretch of the walk down to Honister was a careful balance of staying with the guys until that decision point without losing too much time to the main group. Tim and I pushed on ahead of the 5ers (or 7er, now in Cath’s case), and arrived at Honister to be greeted by Chris (Mrs Tim) and Phil. Tim promptly pulled out, so I focused on refreshment and the fact that I now had a bit of solo walking to do to catch-up the others. Phil told me that Rik (@richardhubbuck) was struggling and, along with Adrian (@turbostream) were only 10-15 minutes ahead of me. Nevertheless, I took the time I needed to rest and refresh, expecting that if they were struggling they’d slow down further anyway. Just as I was about to go, the 5ers turned up. I stayed a few minutes more, confirmed Cath was staying with them, and headed off on a steep climb onto Grey Knotts. Ahead of me a lone figure was climbing up the broken path around the outcrops, and I seemed to be broadly keeping pace with him. I finally caught him at the stile where the fence was broken, being the crossing point to head for the summit. We exchanged a few words and headed for the summit, if not together, then pretty close to each other. It turned out we’d be seeing a lot of each other. 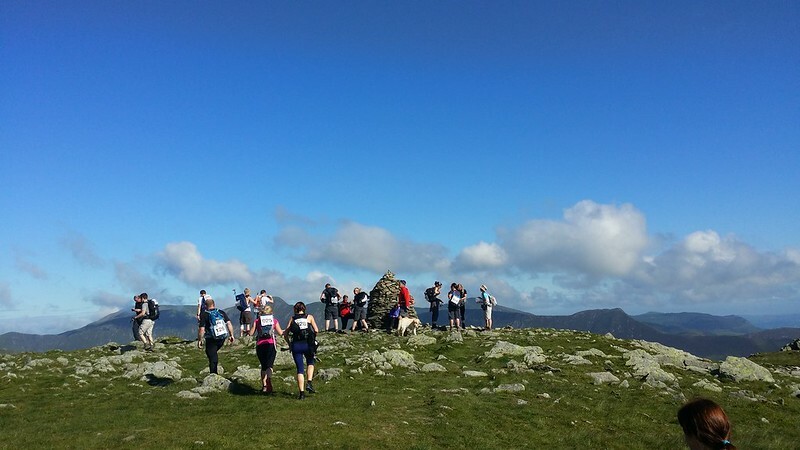 Reaching the summit of Grey Knotts was a morale boost, as it revealed a gentler next leg. By this time over half of the ascent of the course had been completed, but only just over a third of the distance. So the rest of the challenge from here on in was now about endurance. 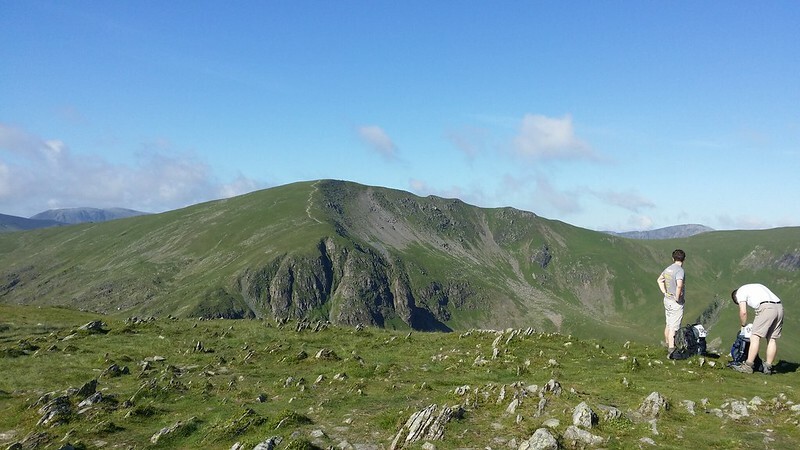 The next leg provided a flatter walk over to Brandreth before a steady climb onto Green Gable. Lone man kept just ahead of me, mainly because I kept stopping to take pictures. Well, I kept stopping to take them, but couldn’t – by this point my touchscreen on my phone had packed up, as sweat had infiltrated the hard case and pooled just over the “take a picture” button. So from here on in, I’m reliant on photos kindly provided by others (Gina @CumbrianBlondie, Phil and Cath). And I did so want to take some photos. Last time I was on these fells, all was clag, whereas today there would good views in all directions. My view of the day was the view down the High Stile ridge with Ennerdale on the left and Buttermere and Crummock Water on the right. I reached Green Gable a minute or so after Lone Man and after checking in with the marshalls, gleaned the fact that Gina, whose number was next after mine and therefore easy to remember, had gone through there at 11:42. It was now 12:50, so they were already an hour ahead of me, and I knew at this point that there was no sense in trying to catch them, and indeed it was unlikely I’d be able to do so. The goal now was simply to get to the end, which to be honest was always the primary goal anyway. But I was feeling strong, and had beaten the target I’d set myself to get to Green Gable by 10 minutes. There was, however, no sign of Rik and Adrian, and enquiries as to whether they’d dropped out yielded no information. Maybe they were still just ahead of me. I climbed down to Windy Gap and looked down Aaron Slack to Styhead, which looked a long way below. I don’t like walking on a loose surface, so the next part of the walk was by common consent considered the worst bit. I slipped and lurched my way down the scree path. Towards the bottom the proximity of a stream enticed me to pause and take a drink using my water filter – the taste of the campsite mains water I’d been necking all day was starting to get on my nerves. It was nice to take a drink of cool, clear and decent tasting water, but I didn’t want to waste time by replacing the full 2 litres or so I had left. I arrived at Styhead and was given a handful of jelly babies from an enomous bag, the only thought going through my head at that point being where to hide the body of the boy dishing them out when I mugged him for the rest. I sat on a rock while I girded my loins for the last significant climb of the day. Off to one side a soldier we’d seen on Castle Crag, lay on the ground, seemingly defeated. This too gave me a little boost. I crossed the gill and followed the slanting track up over the grass taken by those ahead of me, reaching a gully. Arguably the steepest part of the entire walk over grass and rocks, only the knowledge that this was the final significant chunk got me to the top. Lone Man followed me up to the (Wainwright) summit. For me this was the point I knew I’d make it – minimal climbing left to do, and a walk over my favourite parts of the course. I meandered my way over the top of the fell to Sprinkling Tarn, hit the main path and steamed up to Esk Hause, confidence returning with every step. 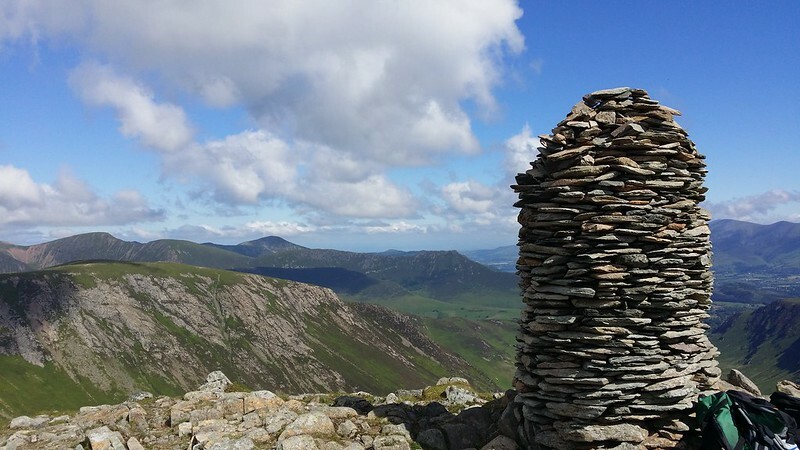 A short hop up to the top of Allen Crags, and I was on the final ridge walk to the end. What I hadn’t thought of though, was the ground underfoot. 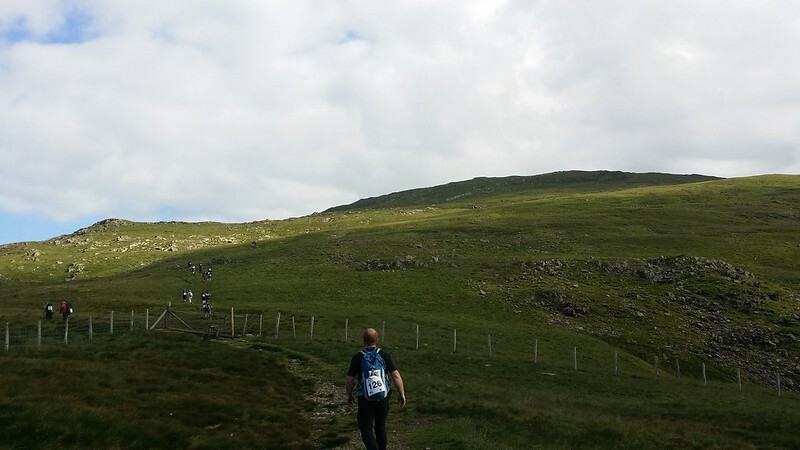 It’s always been a slow walk over the Glaramara ridge for me due to the uneven rocky ground, and now tired after 10+miles the nature of the terrain started to hurt my pace. Any thoughts of squeaking in around the 10 hour mark had already gone though. I got my head down, chain-ate sweets and picked off the undulations one by one, taking short pauses by High House Tarn and Lincomb Tarns, my favourite places on this ridge, to imprint the views on my mind, seeing as my camera wasn’t playing ball. Caught out, as usual, by a cairn that looked like the summit of Glaramara as it was just past some marshalls who said it wasn’t far (even though I know there’s a summit shelter on Glaramara and it involved more of a clamber to get to), I looked across a small depression to the real summit. A visit to the real summit didn’t take long and then I was backtracking to curve down onto Thorneythwaite Fell, initially following the cairns as the path got more indistinct, then simply striding down across grass and heading for the lumpy bits at the end of the ridge. Convinced I may be heading off too far left, I forged a path back to the right and found the stony path. Behind me, Lone Man and a couple of other groups had followed my course down and I guiltily stole onwards lest they catch-up with me. Lone Man and I saw each other again at the summit of Thorneythwaite Fell, the tenth peak, and then I lost him as I tried to get off the fell as fast as my aching feet would allow. I’d forgotten the pain of the long stony descent this way on my first Glaramara walk. Now it all came back to me though. As I got lower and lower, my estimates of completion time got pushed further and further out. I hit the road with relief, and here the pacerpoles came into their own. 15 miles of hard walking but still I could turn on a decent pace using them, and I steamed around to the finish line, just wanting it done. I turned down the offer of a lift from the last marshall who was closing up shop, and finished the last couple of hundred yards. Four green shirts greeted me at the end, and there was some noise too, but most of this just washed over me as I threw the poles to one side and went to sign out. I’d done it in exactly 11:30 which was way beyond what I’d hoped for, but as I’d already said, the goal was to finish. As the last member of the team to finish, the welcome party escorted me to the pub, where Team Social Hiking had annexed the whole of the minute beer garden. Some drinks were then had, some high jinks were performed and most importantly of all, I wolfed down the brownies Gina had saved for me. I found out later that Rik had walked off his problem, and managed to up their pace such that I was never in danger of catching them. It also seemed that the organisers had started to get concerned at me being adrift and had asked the rest of the team where I was. Luckily Cath put them straight that if anyone was ok walking by themselves it would be me, and I guess they could work out from the check-in times at the marshall points where I was too. The remnants of the 5-in-5 team, plus Cath completed their walk too in around 7 hours, and Cath therefore actually did a 7-in-9. The main body of the team completed in 9:52 which was so far ahead of my time that I knew I’d done the right thing in just focussing on my own walk when I found myself alone. If I’d tried to catch them, or even stay with them from the start, I’m pretty sure I wouldn’t have finished. And it made a nice change to walk alone for a change as most of my hillwalking recently has been in company with others. There were no regrets or bitterness on my part, just the reinforcement of the point that I need to walk at a pace I know I can maintain on a challenge such as this. The combined Team Social Hiking map.